The Treatise on the Power and Primacy of the Pope (1537) (Latin, Tractatus de Potestate et Primatu Papae ), The Tractate for short, is the seventh Lutheran credal document of the Book of Concord. Philip Melanchthon, its author, completed it on February 17, 1537 during the assembly of princes and theologians in Smalcald. 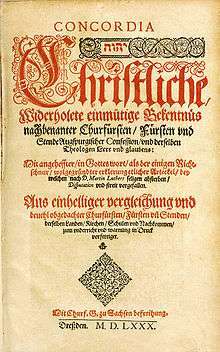 Melanchthon used much the same rhetorical style in The Tractate as he did in the Apology of the Augsburg Confession (1531): both were originally written in Latin. Melanchthon used biblical and patristic material to present and support three main points: 1) the pope is not head of the Christian Church and superior to all other bishops by divine right (de iure divino), 2) the pope and bishops do not hold civil authority by divine right, 3) the claim of the Bull Unam sanctam (1302) that obedience to the pope is necessary for salvation is invalid since it contradicts the doctrine of justification by faith. Melancthon himself held these views to be conditional; should the Pope renounce his claims to power by Divine Right, he could nevertheless maintain them for the sake of good order in the church by human right. Luther's position that the claims of the papacy undermine the Gospel is set forth in this treatise as the position of the Lutheran laity and clergy, and it achieved "confessional" or "symbolic" status rather quickly: the authoritative teaching of what would become the evangelical Lutheran Church. Bente, Friedrich. Historical Introductions to the Book of Concord. (1921) New reprint edition. St. Louis: Concordia Publishing House, 1995. ISBN 0-570-03262-8 View excerpt here. Preus, Robert D. Getting Into the Theology of Concord." Reprint. St. Louis: Concordia Publishing House, 2004. Schlink, Edmund. Theology of the Lutheran Confessions. Translated by P. Koehneke and H. Bouman. St. Louis: Concordia Publishing House, Reprint 2004.